What is the Slave Wrecks Project? The Slave Wrecks Project (SWP) is a long-term collaboration between six core partners, including the Smithsonian’s National Museum of African American History and Culture (NMAAHC). The project is designed to combine research, training and education to build new scholarship and knowledge about the study of the global slave trade, particularly through the lens of slave shipwrecks. Core partners for SWP include the George Washington University, Iziko Museums of South Africa, the South African Heritage Resource Agency, the U.S. National Park Service, Diving With a Purpose and the African Center for Heritage Activities. Conducts groundbreaking research on the historical African slave trade rooted in specific regions, but with a global reach, that incorporates the disciplines of maritime and historical archaeology, history and anthropology. Directly links research in innovative ways to the operations of museums, to public education, to capacity building and to diverse local and global community stakeholders. Documents, cares for and conserves precious historical materials, cultural heritage and historical sites, and promotes programs that involve local and global stakeholders in this mission. Trains and builds capacity for individuals and institutions, especially in Africa, across the African diaspora and in developing-country contexts, particularly in maritime and historical archaeology, archival and community-based historical and anthropological research, artifact conservation and in a variety of other forms of professional and technical training. Educates diverse audiences and interprets both the history of the slave trade and the practice of the project through interpretive platforms, venues and programs. 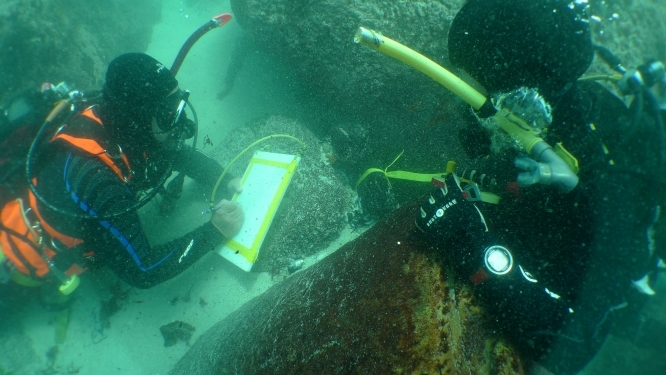 SWP catalyzes a new field of research—maritime archaeology—in the scholarship of slavery and the slave trade, while generating an innovative model through which museums can relate research to exhibits and public education, as well as meaningfully engage with the diverse communities of local, national and international stakeholders. The project establishes a new model for international collaboration among museums and research institutions, and it links research to professional training, institutional capacity building, heritage protection and fields of heritage tourism. Perhaps the single greatest symbol of the trans-Atlantic slave trade is the ships that carried captive Africans across the Atlantic never to return. As of yet, however, there has never been archaeological documentation of a vessel that foundered and was lost while carrying a cargo of enslaved persons. Locating, documenting and preserving this cultural heritage has the potential to reshape understandings of the past, making unique and unprecedented contributions to the study of the global slave trade. In addition, publicly displaying and interpreting this history through a variety of platforms provides the opportunity for a worldwide public to experience and grapple with authentic pieces of the past that played such a foundational role in shaping world history. SWP core partners bring together complementary strengths and capacities in their international collaborative effort to investigate the slave trade from novel and multifaceted scholarly perspectives to address the challenge of preserving and protecting this unique heritage, to provide the training and build institutional capacities and to develop innovative interpretive and dissemination platforms in museums, on the Web and through public programs, which speak to both the local significance of this heritage in specific locations across the globe and to the global significance that this shared heritage represents. Iziko is an isiXhosa word meaning “a hearth.” Because the hearth of a typical African homestead usually occupies the central space, Iziko symbolizes both a hub of cultural activity and a central place for gathering together South Africa’s diverse heritage. Iziko Museums of South Africa is a declared national heritage institution established as a flagship museum bringing together 11 museums under a single governance and leadership structure. Iziko is governed by a council appointed by the minister of arts and culture. Its core mission is to manage and promote Iziko’s unique combination of South Africa’s heritage collections, sites and services for the benefit of present and future generations. Jaco Jacqes Boshoff is a maritime archaeologist for Iziko, a co-founder of SWP and the principal archaeological investigator on the São José shipwreck excavation (www.iziko.org.za/). The National Museum of African American History and Culture was established by an Act of Congress in 2003 making it the 19th museum of the Smithsonian Institution. Scheduled for completion in fall 2016, it is being built on the National Mall in Washington, D.C., on a five-acre tract adjacent to the Washington Monument. For more information, visit nmaahc.si.edu or call (202) 633-1000. Paul Gardullo is a historian and curator at the museum and its lead representative with SWP. GWU is private research university located in Washington, D.C. The university was chartered by an Act of Congress in 1821 as the Columbian College in the nation’s capital. It is the largest institution of higher education in the District of Columbia (http://www.gwu.edu/). Based at GWU, CAI aims to protect and preserve cultural heritage through advocacy programs and initiatives by using the multitude of diplomatic and governmental resources in the Washington, D.C., area. Stephen Lubkemann, associate professor of anthropology, Africana studies and international affairs at GWU, is co-founder of SWP and serves as its international coordinator. He is also the co-principal investigator on the São José project. SAHRA is the national heritage agency in South Africa and is one of the founding partners of SWP. A statutory organization established under the National Heritage Resources Act, No. 25 of 1999, SAHRA is the national administrative body responsible for the protection of South Africa’s cultural heritage. John Gribble is the manager of the Maritime and Underwater Cultural Heritage Unit at SAHRA and is the principal liaison with SWP (www.sahra.org.za/). The U.S. National Park Service cares for special places saved by the American people so that all may experience their heritage. It cares for 401 national parks and helps communities preserve their historic places and open spaces. SRC supports stewardship for the protection, preservation, public access and interpretation of submerged resources (www.nps.gov/submerged/). Since 2009, the National Park Service’s SRC has been a principal contributor to SWP for technical capacity, training, remote sensing survey—and has provided training opportunities for African and American researchers in the United States. David Conlin is SRC’s chief at the National Park Service and the SRC’s principal representative to SWP. SEAC performs archaeological research, promotes education and outreach and offers technical support for U.S. national park units in the southeast region of the United States. It has been a core collaborator in SWP research and training efforts undertaken in Florida (since 2010) and in the developing efforts in the U.S. Virgin Islands (since 2014). David Morgan is SEAC’s director and SWP’s prime liaison. A registered not-for-profit organization, DWP is a subsidiary of the National Association of Black Scuba Divers (NABS) (http://www.nabsdivers.org/homepage.html). Founded in 1991, NABS is an international membership organization with a mission to create a network of people and resources that provide educational experiences that enhance and promote an appreciation of diving and an awareness of the aquatic environment. DWP provides a specialization within that broader mission, focusing particularly on underwater archaeology education. DWP and SWP are strategic partners in underwater archaeology surveys. Jose Jones is a co-founder of NABS, a director of DWP and the DWP representative and co-chair of SWP’s advisory board. ACHA is a South African-based not-for-profit organization that does development and capacity building work across Africa. ACHA also carries out excavations, undertakes heritage and archaeological impact assessments and acts as a center for researchers and research into all things heritage. It helps researchers access funding and international networks of experts and coordinates global projects aimed at developing heritage, capacity and economies. Jonathan Sharfman is its director and a maritime archaeologist working in sub-Saharan Africa. Sharfman has been associated with SWP since 2005. Launched in 2008 as the Southern African Slave Wrecks and Diasporan Heritage Routes Project with a seed grant from the Ford Foundation, the project initially focused on Southern Africa and launched its first research efforts in the republic of South Africa. From its inception, the project has sought to assist developing-country partners in the advancement of cultural resource management programs that can preserve and protect irreplaceable heritage related to the historical slave trade and Africa’s global diaspora, while also fostering a unique niche for regional cultural tourism with tangible economic benefits and promoting capacity building for educational, heritage and scientific institutions in partnering countries. Now in its second phase (2012–2017), SWP has expanded the geographic scope of the project to reflect the global reach and impact of the African slave trade. While the project continues to pursue and expand its activities in South Africa, the current phase also features the development of activities in other regions as well, with an added focus on sites in the Americas. Work is currently in progress and partnerships are under development in North and South America, in the Caribbean, in West Africa and in the East Africa/Indian Ocean regions.